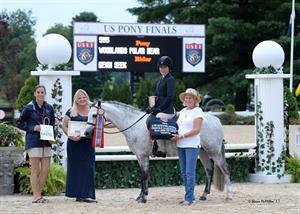 The first championship titles of the US Hunter Pony Championship presented by Sallee Horse Vans were claimed Wednesday. 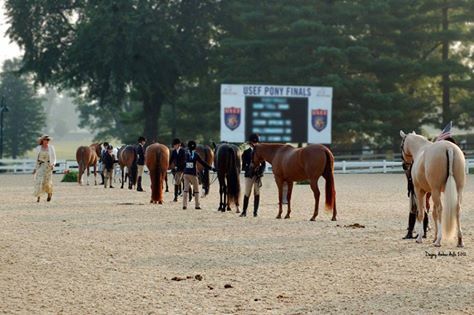 The Large Regular Hunter Ponies and the Small Green Hunter Ponies completed their final phases of competition in the 2015 US Pony Finals at the Kentucky Horse Park. 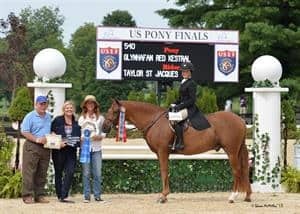 Taylor St. Jacques and Glynhafan Red Kestral earned top overall honors in the Large Regular Hunter Pony Championship, while Devin Seek and Woodlands Polar Bear received the Small Green Hunter Pony Championship title. National titles are determined following three phases of competition, with Model and Under Saddle phases, each counting towards 25% of the overall score, and the remaining 50% is determined by the Over Fences phase. St. Jacques (Glen Allen, Va.) and Peacock Ridge LLC’s Glynhafan Red Kestral earned the Large Regular Hunter Pony Championship after a fantastic round in the Over Fences phase to score 260.6. The pair finished first in the phase. On Tuesday, she and the 10-year-old Half Welsh gelding received scores of 252.05 and 252.12 in the Model and Under Saddle phases, respectively, putting them in sixth place overall. Their strong over fences performance pushed them from sixth to the top of the leaderboard to win the Champion ribbon with a final score of 1025.39. This was St. Jacques’ second Champion title in her three years at the US Pony Finals, made all the more meaningful since it is her last year at the premier event. “It definitely means a lot to end this well,” she added. The Reserve Champion title went to Morgan Ward (Milford, N.J.) and Dr. Betsee Parker’s Enjoy the Laughter with a final score of 1022.63. 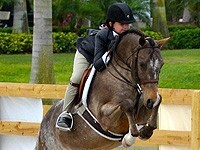 She and the 10-year-old German Riding Pony gelding scored 251.64 in the Over Fences phase, after earning 264.85 in the Model phase and 254.50 in the Under Saddle phase. Abigail Brayman and Linda Evans’ Dreamland finished third in the Large Regular Hunter Pony Championship with a total score of 999.93, and their over fences score putting them in second place in the phase. She and the 10-year-old Welsh/Thoroughbred/Warmblood cross gelding finished with scores of 240.73, 253.00, and 253.10 in the Model, Under Saddle, and Over Fences phases, respectively. Abigail Lefkowitz was the Champion Owner/Rider in the division with her own Vermont Show Me The Gold after finishing in sixth place overall. Courtney Morton’s mount, Peridot, won Best Presented Model Pony, and One More Time, the mount of Adam Edgar, was named Best Turned Out Pony. Seek (Ocala, Fla.) and Woodlands Polar Bear (pictured) won the Small Green Hunter Pony Championship with a score of 990.55. She and Bibby Hills’ eight-year-old Welsh Pony gelding received scores of 239.69 in the Model phase and 251.20 in the Under Saddle phase on the first day of competition. Like St. Jacques and Glynhafan Red Kestral, Seek and Woodlands Polar Bear climbed from sixth place overall to the top of the leaderboard after claiming top honors in the Over Fences phase with a score of 249.83. The Reserve Champion title went to Sophia Calamari (New Milford, Pa.) and Jessie Spade’s With Applause with a final score of 989.66. She and the 10-year-old Welsh Pony Cross gelding had solid scores of 255.13, 264.45, and 235.04 in the Model, Under Saddle, and Over Fences phases, respectively. 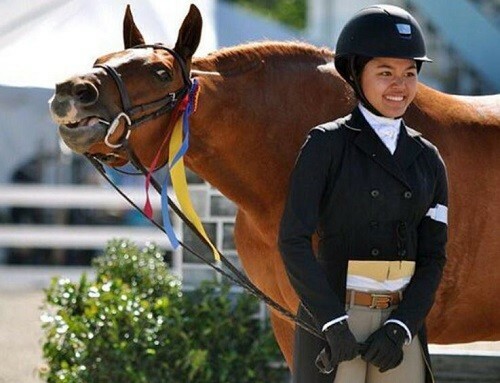 Dakota Champey (Far Hills, N.J.) and MDHT Equestrian, LLC’s IFlirt were third in the Small Green Hunter Pony Championship after scoring 981.74 overall, also earning Champey the Champion Owner/Rider title. She and the seven-year-old Welsh Pony Cross mare received scores of 250.73, 239.25, and 245.88 for the Model, Under Saddle, and Over Fences phases, respectively. 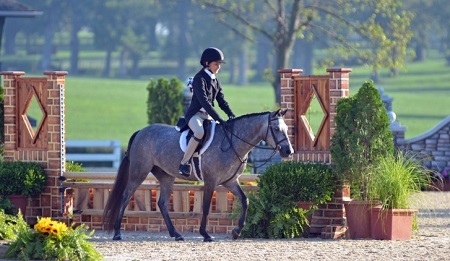 Their score in the Over Fences phase earned them second place in the class. IFlirt was named the Best Turned Out Pony in the division. Competition continues Thursday with the Medium and Large Green Hunter Ponies contesting the Model and Under Saddle phases in the Walnut Arena. Then, the Small Regular Hunter Ponies will complete the Over Fences to determine the champion. In the evening in the Alltech Arena, the US Pony Jumper Championship will get underway with the Individual Phase I.